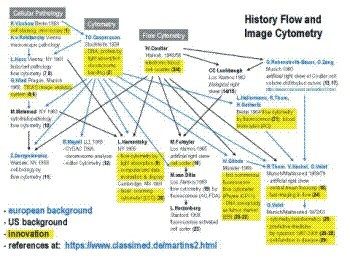 Cytophotometry (1) and electronic cell counting (2, 3) generated in the history of flow cytometry from early on significant interest amongst biomedically oriented scientists. It took, however, a certain time until eminent clinical hematologists were convinced of the usefulness of electronic red and white blood cell and platelet enumeration by Coulter counters (4, 5, 6) in comparison to the long established counting chamber methods. To speed up the acceptance process, Wallace Coulter as globally thinking entrepreneur and instrument developper travelled around 1958/59 personnally with a Coulter Model A counter in his luggage to various institutions in Europe that he considered of strategic interest. One of these institutions was the Max-Planck-Institute für Biochemie in Munich (MPI-Biochemie), headed by nobel laureate Adolf Butenandt where he addressed Gerhard Ruhenstroth-Bauer, hematologist and director of the Department of Experimental Medicine. Ruhenstroth was interested, bought a Coulter A counter with a serial number around 550 and the particular interest to measure volume distribution curves of cells. This is possible because the signal amplitude of the counting pulses in electrical cell sizing is proportional to cell volume. He considered this feature of the instrumentat of particular interest for the better characterisation of cells from blood, leukaemias and cancers. Thus Klaus and later Odila Zang, two young scientists of his laboratory, investigated volume distribution curves of various cell types (7). They recognized that Coulter cell volume distributions were right skewed for erythrocytes. This was considered of probably artefactual nature since from previous microscopic and electron microscopic evidence, symmetric Gaussian normal distribution curves were expected. Wallace Coulter being primarily interested in the use of electronic blood cell counting for clinical purposes was not enthousiastic about these unforeseen findings. When Ruhenstroth wanted to publish this observation, he considered legal action against the MPI-Biochemie for distributon of non advantageous rumours about his instrument. Around the same time, a group of scientists at the Los Alamos National Laboratories likewise observed the right skewed (8) volume distribution curves of erythrocytes in healthy individuals. They interpreted it as a biological phenomenon caused by the overlapping of two separate erythrocyte populations. Nevertheless, Ruhenstroth continued to consider the right skew in erythrocyte volume distribution curves of healthy humans an artifact and remained highly interested in volume distribution curves of cells mainly in the context of malignant cell populations. Potential conflicts with Coulter were circumvented by asking Butenandt for an equivalent of 250.000 Euro (a comparatively enormeous sum at this time, corresponding for example to the countervalue of 10 high speed ultracentrifuges, like the Beckman Spinco L-50) to develop instrumentation independently. Butenandt was initially hesitant but finally made the funds available. Jürgen Gutmann was hired as an electronic engineer, and an electronic as well as a mechanic workshop were equipped to begin the instrument building phase of the experimental medicine department (9 --> fig.1, 10, 11, 12 --> fig.2 left) in its former location in central Munich, close to the main railway station (Goethestrasse 31) from where the institute moved to the newly built Martinsried facilities in 1972. Klaus & Odila Zang, Jürgen Gutmann, Mac Fulwyler (13) and others observed the right skew of Coulter volume distribution curves, all considering it an artefact. Gutmann hypothesized that biconcave erythrocytes went through the sizing orifice in variable orientation like lengthwise, transverse or in intermediate position causing variable displacement of electrical field lines leading to increased signals for transversely passing erythrocytes. Right skew in nucleated cell volume distribution curves was interpreted as representing cell size differences during cell cycle. Gutmann's concept was not confirmed by the subsequent investigations initiated by Reinhard Thom, a clinician from Berlin (Klinikum Westend, Freie Universität Berlin). He modified a standard Coulter orifice by a hydrodynamically focused cell influx capillary in front of the sizing orifice while staying as a guest scientist at the MPI-Biochemie (14, 15, 16). The available Metricell sizing instrumentation, as developed by Volker Kachel (17) (fig.2 right) in continuation of Gutmann's earlier work was used for the measurements. The interest in path, shape and orientation of the cells on the way through the orifice required their photographic visualization, using a special observation chamber in combination with ultrashort flashlight (40nsec) pulses (17 -> fig.4a). A quartz observation chamber had been fabricated earlier by Zeiss (Oberkochem) during a collaborative effort 1966/67 that had been stimulated by the development of the first optical flow cytometer in a modern sense by Kamentsky (18). In this cytometer, cell DNA was determined by optical absorption at 253.7nm simultaneously with a cell light scatter measurement at 410.0nm. The project idea with Zeiss was to simultaneously measure DNA at 253.7nm and protein content at 280nm together with the electricaly determined cell volume. Zeiss provided a tuneable monochromator with HBO200 mercury arc lamp in conjunction with a sophisticated UV-microscope. The measurements were technically possible with this setup but it became soon clear that the observed signals were mostly light scatter signals and therefore not sufficiently specific for the separation between DNA and protein of unstained cells in flow. The project was abandoned but the quartz chamber, kindly donated by Zeiss, proved very useful for the subsequent extensive high speed photographic investigations of cells passing through electrical sizing orifices. The photographs showed that erythrocytes travelled always lenghthwise in the quickly accelerating fluid stream through the orifice. Erythrocytes passing over the edges of the orifice entrance traverse zones of elevated electrical field strength, resulting in higher electrical pulses than cells passing through the center of the orifice. Erythrocytes or monodisperse microbeads, focused on restricted pathways through the orifice were exposed to similar electrical field strengths, resulting in the postulated symmetrical volume distribution curves (15, 19). Spielman & Goren (20) had equally observed a narrowing of Coulter volume distribution curves by hydrodynamic focusing around the same time but did not provide experimental explanations for their observation. Conclusion: The extensive experimental work in connection with proving of the hypothesis that the right skew of volume distribution curves in Coulter counters was artefactual, has lead to the development of the cell sorter (13) as well as to fast imaging in flow (21). A major bottleneck in cytometric investigations concerned from the beginning data display and data analysis, given the comparatively high data acquisition rates between typically 1.000 and 5.000cells/sec. The initial hardware solution at MPI-Biochemie consisted of a set of around 20 relays, each with an attached step wheel with a string carrying a small weight at its distal end. Each relay advanced its step wheel after a given number of cells counts within its pulse height window (channel) representing a certain cell size range. This resulted in a display of inverted cell size histograms (fig.2 left). In addition, the absolute cell count for each histogram channel was printed. 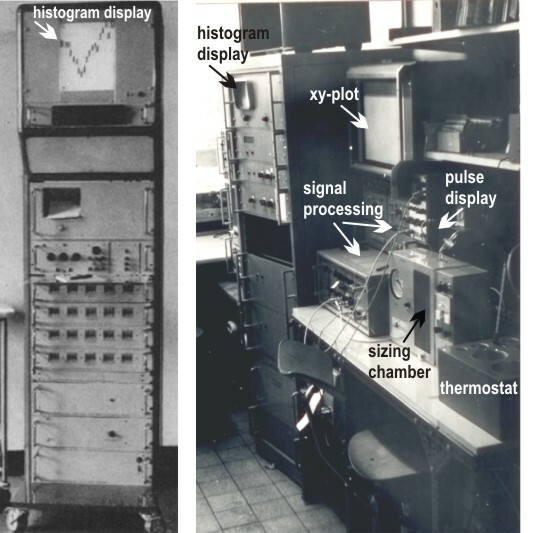 Record keeping was improved by the use of an oscilloscope as histogram display and of an xy-plotter that provided plots of the measured histograms (fig.2 right). Nevertheless the quantitative information for histogram comparison and further analysis was only available on paper. The increased resolution of of cell volume distribution curves by hydrodynamically focused measurements lead to the discovery of discrete size populations of erythrocytes during the first trimenon of life (22) in various mammalian organisms or in adult animals after x-irradiation (23) or strong bleeding. Depending on species, these populations contained different hemoglobins and in addition differences in antigen expression or electrophoretic mobility as consequence of switched gene expressions patterns. Having shown that the volume distribution curves had the potential to monitor gene activation patterns in the hematopoietic system, a more detailed data analysis was required to understand the sequence of events. The printed cell contents of the various channels of the volume distribution histograms were analysed in a first approximation on probability paper (22, 23) to obtain a model of the sequence of cell populations, thus reducing the many initial histogram channel counts into a sequence of means, standard deviations and % contribution of various cell populations over time. Such tasks require typically a computer for curve fitting by mathematical functions. Computers were, however, at this time far too expensive for such an analysis. The move of the institute to Martinsried in 1972 provided access to a Siemens 4004 main frame computer that had been purchased by the Max-Planck Gesellschaft for the equivalent of around 2 million Euros to advance the evaluation of electron microscope and x-ray crystallography data. The computer had a core memory of around 1Mbyte. From now on, cell volume distribution curves could be iteratively fitted by standard Gaussian normal distributions or by other functions with substantially more information and knowledge being extracted (24, 25) than by the visual inspection of histograms. It was also easier to evaluate cell aggregation for example of erythrocytes as cause of the clinically observed erythrocyte sedimentation rate (ESR) in anticoagulated blood samples (24). With the introduction of fluorescence into commercial flow cytometry by Wolfgang Göhde (26, 27) and into cell sorting in Len Herzenberg's laboratory (28), flow cytometry gained access to an essentially unlimited number of specific molecular stains. It seemed especially important for medicine oriented cell biochemistry to develop into this direction since work prior to the development of fluorescence flow cytometry had shown the importance of relating biochemical changes in tissues to the cellular level in order to better understand their biological and physiological significance (29). Phywe company (Göttingen) commercialized Göhde's instrumentation but difficulties existed in purchasing only the optical part of the instrument since the intention at MPI-Biochemie was to use own electronics for signal amplification and list mode data acquisition as well as the use of a performant computer for list mode data evaluation. A member of the Phywe board of directors happened to be senator of the Max-Planck-Gesellschaft. He arranged the purchase of the optical part of the very first commercially produced Phywe ICP11 instrument (W.Göhde personal communication) in 1969. Despite high interest and intensive development, it took until 1977 to accomplish the full functionality of the devised FLUVO-Metricell flow cytometer (30) (fig.3). The instrument measured hydrodynamically focused electrical cell volume and two fluorescences with the Phywe ICP11 optics. Signals were amplified by 3-decade logarithmic amplifieres and visualized on hardware display units. 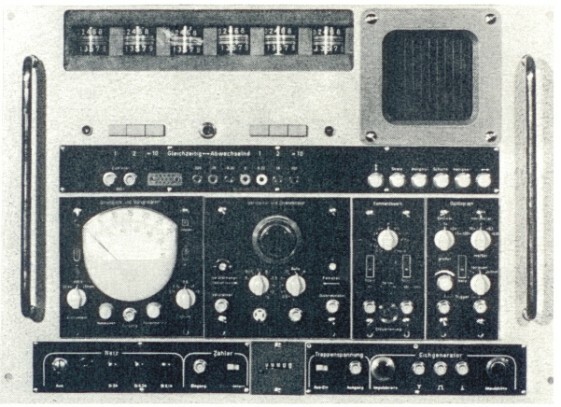 The measured pulse heights of cells or particles in each of the data acquisition channel were simultaneously transferred in list mode format on-line to a Perkin Elmer INTERDATA 7/32 computer, equipped with a 220Mbyte hard disk drive and a 9-track tape unit for data storage. This provided an essentially unlimited list mode storage capacity as well as a significant list mode evaluation potential. The total unit was especially with regard to data processing for years in advance of commercially available instrumentation. During the FLUVO-Metricell instrument development, cell volume studies as well as software developments were further advanced (31, 32). The use of electrical sizing instead of light scatter as in laser instruments complicated the hardware but was considered essential in a cell biochemistry environment to be able to calculate relative substance concentrations in cells as well as average molecule packing densities on cell surfaces. The concentration on cell functions (functional flow cytometry, functional cytomics) as fast indicators of disease activity in patient cells was a main strategic goal at MPI-Biochemie. Stains and assays for the flow cytometric determination of intracellular pH, Ca2+, free radicals, glutathione, proteases, esterases and phosphatases or for transmembrane and mitochondrial potentials in single viable cells were developed, using propidium iodide to monitor simultaneously the DNA of dead cells at UV or blue light excitation (for details refer to 33, 34). Other institutions followed different goals. The efforts of a significant number of hospitals and research institutions using the standard mercury arc lamp equipped Phywe ICP11 flow cytometer, mostly in Germany, concentrated preferentially on clinical DNA analysis in malignant disease. The Los Alamos and Livermore laboratories with their laser flow cytometers and cell sorters were substantially centered on cell cycle and chromosome research, the Sloane Kettering group on DNA conformation in the cell cycle of normal and abnormal cells while immunological and immunogenetic mechanisms were of prime interest for the Stanford laboratory. 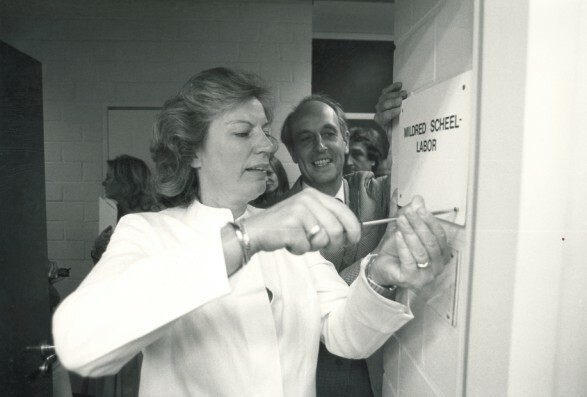 Dr.Mildred Scheel, the wife of former German Bundespräsident Walter Scheel had founded the Deutsche Krebshilfe as well as the Mildred-Scheel Foundation to provide better care for cancer patients and to advance cancer research in Germany. Following significant funding of clinical institutions, certain criticisms emerged that not enough was done for the research sector. This prompted the Mildred-Scheel Foundation together with the Max-Planck Gesellschaft zur Förderung der Wissenschaften to internationally announce a 5 year research project in the area of medicine oriented basic cancer research. Günter Valet applied as did more than 50 other scientists and was finally appointed head of the independent Mildred-Scheel Laboratory for Cancer Cell Research (fig.4) after a thorough two year selection process by a search committee, consisting of around 20 eminent scientists from the Deutsche Krebshilfe, the Max-Planck-Gesellschaft as well as from several universities and cancer research institutes in Germany. The submitted project proposal aimed at the simultaneous multiparameter analysis of single cells by flow cytometry as a sensitive approach for the automated detection and molecular characterization of cancer cells in patients as well as at the development of suitable benchtop instrumentation for this purpose. The Mildred-Scheel Foundation provided the equivalent of 1.5 Mio Euro for salaries while the Max-Planck Gesellschaft contributed the laboratories and running costs in the order of 0.5 Mio Euro. Dr.Scheel as former radiologist, followed the project with close attention but died in 1985 of cancer. fig.5 Cell function in cytomics: left: intracellular pH & esterase staining (ADB/DCH) of viable rat bone marrow cells (blue) and of the DNA in dead cells (PI) (red). right: contour line display of the flow cytometric measurement of around 6.000 cells of the stained cell preparation from the left panel. For further details of the cell biochemistry group see literature references 1981-1990. After 5 years, the project was prolonged for another 3 years until 1989, amounting to a total funding of around 3.2 Mio Euro. It was at this time the largest project, the foundation had ever funded. About 10 FLUVO-Metricell II instruments, data recording or display modules were produced by the technical group and sold to scientific institutions between 1984-1989 with reinvestment of the income into further research. The reasons for the termination of the project in 1989 were that flow cytometry had become a routine technology and research in the earlier context was not considered of primary interest any more. Following the termination of the Mildred-Scheel Laboratory project, the cell biochemistry part of the Martinsried flow cytometry group remained as Cell Biochemistry Group scientifically independent and continued the work with funds from European research projects, through Sonderforschungsbereiche of the Deutsche Forschungsgemeinschaft (DFG) and basic funding by the Max-Planck-Gesellschaft. Given the fast technological progress, commercial instrumentation such as the PASIII cell analysis and closed piezo cell sorter system (Partec, Münster, Germany) met increasingly the needs of basic cell biochemistry research and did not require further in-house technological development. Likewise, personal computers provided enough computing power for cytometric list mode data analysis. Decreasing support in combination with an increasing accumulation of multiparametric data sets in many clinical environments generated a gradual shift from the production of own data to processing other groups data. This was advantageous since it would have been experimentally very difficult to generate the amount of experimental and clinical data required for the development of the envisaged concepts within a single laboratory. - the view that cytometry and later cytomics constitute a biomedical key discipline where the explicit analysis of the heterogeneity of cell systems in form of system cytometry (1997) represents a comparatively efficient top-down strategy for the systematic resolution of the cellular and molecular biocomplexity of higher organisms with one of the important advantages being that complex disease mechanisms can be efficiently investigated without necessity for extensive a-priori knowledge and molecular pathway modeling. 1. The early instrument development terminated the long going controversy about the right skewedness of cell volume distribution curves by electrical sizing by recognizing the importance of hydrodynamic focusing to avoid the right skew. It furthermore provided early computerized list mode data acquisition as an important prerequisite for the efficient extraction of information and knowledge from multiparameter flow cytometry measurements. 2. The development of flow cytometric cell function assays enabled the fast molecular evaluation of disease states as well as predictions about the future disease progress in individual patients. The flow cytometric determination of cell function has advanced on its own into a steadily growing field in medicine and cell biochemistry but also in the pharmaceutical industry in form of high-throughput and high-content assays for drug discovery, both by flow cytometry and image cytometry. 3. The development of data pattern analysis (data sieving) by the CLASSIF1 algorithm permits the exhaustive and standardized knowledge extraction from flow cytometric list mode files as well as from multitudes of other multiparameter data. 4. Data pattern analysis enabled amongst others the development of the concepts of individual patient disease course prediction by SMDC (standardized multiparameter data classification) and system cytometry as well as the cytome & cytomics definitions (Omics-glossary (2001)), leading to the concepts of predictive medicine by cytomics, of a human cytome project and of a periodic system of cells. The fields of cytometry and cytomics have been fascinating over many years by the collaboration of scientists being interested in trans-disciplinary (cross-disciplinary) concepts and their potential to provide entirely new insights into cellular biomechanisms. 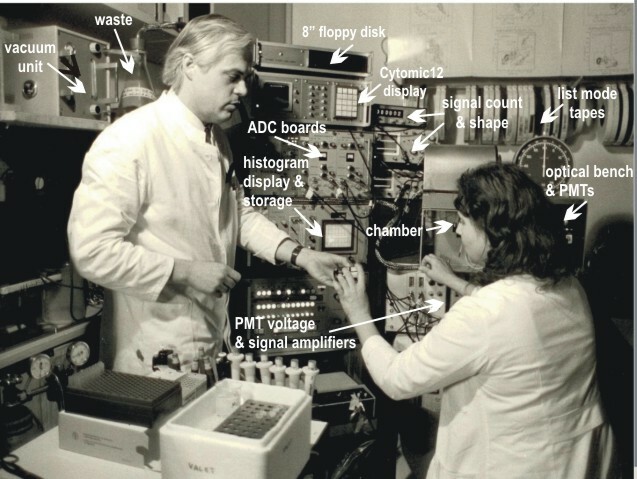 Flow cytometry and image cytometry instrument developpers were initially (1965-1985) rather competing against each other for supremacy in the sensitive detection of cancer cells but the efforts have become more and more collaborative and mutually complementing in recent years. Flow cytometry with its early on fluorescence orientation has substantially enhanced the development of new stains, proving equally useful for molecular biology as for single cell oriented image cytometry like in confocal or laser scanning microscopy. The cytometric field continues to be fascinating through its potential to unfold the organismal (organismic) biocomplexity top-down by single cell molecular analysis in-situ that is with all molecules in place, lending itself to the reverse engineering of the assembled molecular machinery as well as to the investigation of the natural heterogeneity of cells in tissues and in complex disease mechanisms as one of the bases for the adaptivity of organisms in variable environments. The top-down approach seems particularly promising since the knowledge of the entire set of biomolecules as derived at the genome level does by itself so far not provide enough information for their molecular reassembly in form of living cells, tissues, organs or organisms. The fascination for the cell biochemistry and cytomics fields will therefore in all likelihood not only continue but further increase, seen the overall potential and challenges of this approach. 1. T Caspersson. Cell growth and cell function, a cytochemical study. Norton, New York (1950). 2. WH Coulter. Means for counting particles suspended in a fluid. US patent 2,656,508 priority Aug 27, 1949. 3. WH Coulter. High speed automatic blood cell counter and cell size analyzer. Proc Natl Electronics Conf 1956, 12: 1034-1042. 4. G Brecher, M Schneiderman, GZ Williams. Evaluation of electronic red blood cell counter. Am J Clin Pathol 26:1439-1449(1956). 11. KD Zang. Automatische Zählung und Volumenbestimmung von Zellen auf elektronischem Wege. Deutsche Med Wschr 84:1710-1716(1964). 13. MJ Fulwylwer. Electronic separation of biological cells by volume. Science 1965, 150: 910-911. 14. R Thom. Anordnung zur Gewinnung von Größen, die den Mengen von in der Untersuchungsflüssigkeit enthaltenen Teilchen verschiedenen Volumens entsprechen. Patent DE1806512, priority Nov 02, 1968. 18. LA Kamentsky, H Derman, MR Melamed. Spectrophotometer: New instrument for ultrarapid cell analysis. Science 1965, 150: 630-631. 26. W Göhde Automatisches Meß- und Zählgerät für die Teilchen einer Dispersion. Patent DE1815352, priority Dec 18, 1968. 27. W Dittrich, W Göhde. Impulsfluorimetrie bei Einzelzellen in Suspensionen. Z.Naturf 24b:360-361(1969). 28. HR Hulett, WA Bonner, J Barrett, LA Herzenberg Cell Sorting: Automated separation of mammalian cells as a function of intracellular fluorescence. Science 166:747-749(1969). 29. G Valet. Esteraseaktivität und Proteingehalt der Milz von röntgenganzkörperbestrahlten Ratten unter Berücksichtigung funktionsmorphologischer Gesichtspunkte. Dissertation, Medizinische Fakultät der Ludwig-Maximilian Universität München (1968) p.50, last part of par.22. 30. V Kachel, E Glossner, E Kordwig, G Ruhenstroth-Bauer. Fluvo-metricell, a combined cell volume and cell fluorescence analyzer. J Histochem Cytochem 25:804-812(1977). 31. G Valet, S Bamberger, H Hofmann, G Ruhenstroth-Bauer. Flow cytometric determination of the surface charge density of the erythrocyte membrane using fluorescinated polycations. J Histochem Cytochem 27:342-349 (1979). 32. G Valet. Graphical representation of three parameter flow cytometer histograms by a newly developed FORTRAN IV computer program. In: Flow Cytometry IV, Eds: OD Laerum, T Lindmo, E Thorud, Universitetsforlaget, Oslo 1980, p.116-119. 35. V Kachel, H Schneider, K Schedler. A new flow cytometric pulse height analyzer offering microprocessor controlled data acquisition and statistical analysis. Cytometry 1:175-192 (1980). 36. V Kachel, K Schedler, H Schneider, L Haak. "Cytomic" data system modules - modern electronic devices for flow cytometric data presentation and handling. Cytometry 5:299-303 (1984). 37. V Kachel, H Schneider. On-Line three-parameter data uptake, analysis and display device for flow cytometry and other applications. Cytometry 7:25-40(1986).